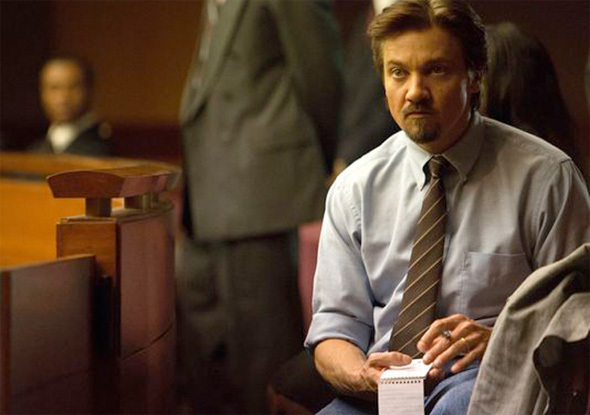 Earlier this year, we heard about a project called Kill the Messenger starring Jeremy Renner. "Homeland" director Michael Cuesta was behind the film that doesn't paint the CIA in the best light as it follows the agency's scheme to craft a smear campaign to ruin the reputation of journalist Gary Webb (Renner) after he linked the CIA to a scheme to arm Contra rebels in Nicaragua and import cocaine into California. Now some first look photos from the film have arrived with Renner looking like a very intrepid journalist. The cast also includes Tim Blake Nelson, Oliver Platt, Michael Sheen, Robert Patrick, Barry Pepper, Mary Elizabeth Winstead, Andy Garcia, Rosemarie DeWitt and many more. Look! Kill the Messenger is directed by "Homeland" producer and director Michael Cuesta with a script from Peter Landesman (Parkland), who wrote the script from Webb's book Dark Alliance: The CIA, The Contras, And The Crack Cocaine Explosion and Nick Schou’s Kill The Messenger: How The CIA’s Crack-Cocaine Controversy Destroyed Journalist Gary Webb. The film details the true story of a reporter (Jeremy Renner) who detailed the CIA's connection to the crack cocaine trade, only to be smeared as a result, losing his job, falling into depression, and eventually killing himself. Focus Features releases the film sometime in 2014.